Due to the complexity of the theatre design, delay speakers for the audio system were required featuring 32 Meyer Sound UP-4XP’s along with the newly release Galaxy 816 processors. Surround speakers behind the audience are made up of 34 Meyer Sound UPM-1XPs. They provide high sound pressure levels, extremely low distortion, and uniform directional control, yet are discreet enough to blend into the aesthetics – in fact they are hidden in the rear wall of the theatre. These speakers also work with the surround rings to produce even coverage. A second row of surrounds comprises 10 L-Acoustics 12XT loudspeakers, so between these two surround rings it’s possibly to get ample coverage for different imaging of effects and reverbs. Front-fill duties are taken care of by 24 Meyer Sound MM-4XPs, which are ideal in size and because they are waterproof and also low voltage, there is no need to worry about them being too close to the pool. Completing the loudspeaker line-up are eight K-array KP102’s and four K-array Anakonda KAN200+ flexible arrays, both of which are used as hidden fill loudspeakers. “The K-array products are ideal cosmetically because they blend in with the environment, the theatre designers were happy that the loudspeakers weren’t so intrusive of their design,” said Sebastian. Two K-array all-in-one KA84 audio power amplifiers look after power and processing needs for the K-array boxes. Amplification and control for L-Acoustics systems, is provided through the company’s amplified controllers – the LA8 and the LA4X. A total of 19 LA8’s and four LA4Xs are in place at Le Perle and both amplifiers are more than adequate for the theatre in terms of EQ’ing and delay. With the Meyer Sound cabinets being self-powered all they require is loudspeaker management, which is provided courtesy of a BSS London Soundweb BLU-806 and six BLU-160’s. BSS is looking after all of our signal flow in terms of outputs to the PA, it’s helping us with routing, matrixing and also processing for certain elements. The amplifier and processor racks are kept in climate controlled rack rooms, therefore eliminating the possibility of them getting wet, which ultimately extends the longevity of the show. 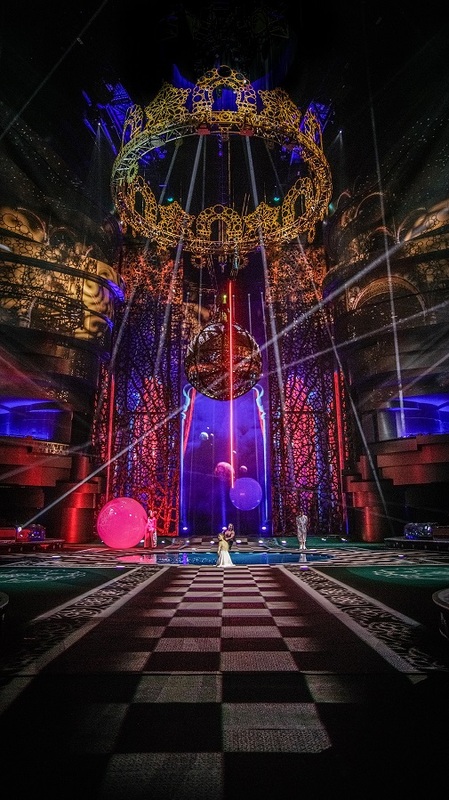 Adding yet another dimension to the visual display are the lighting fixtures – a combination of intelligent moving lights and traditional theatre followspots. 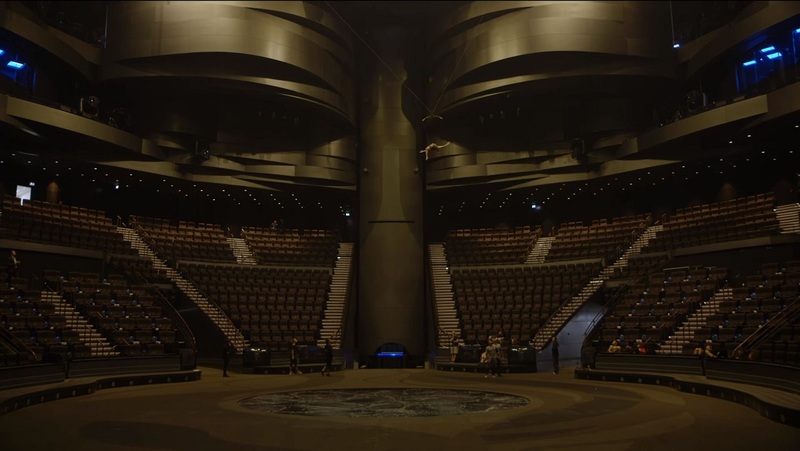 The lighting design for La Perle wasn’t a straightforward task, although a beautiful theatre it isn’t symmetrical and it isn’t linear, instead it’s full of curves, which presents many problems. Add the need for the fixtures to be silent or very quiet – a normal requirement in any theatrical space. A large Clay Paky inventory has been specified for La Perle including Sharpys, Super Sharpys, Alpha Profile 1500’s, Alpha Profile 800’s, Alpha Wash 1500’s, Alpha Beam 1500’s. 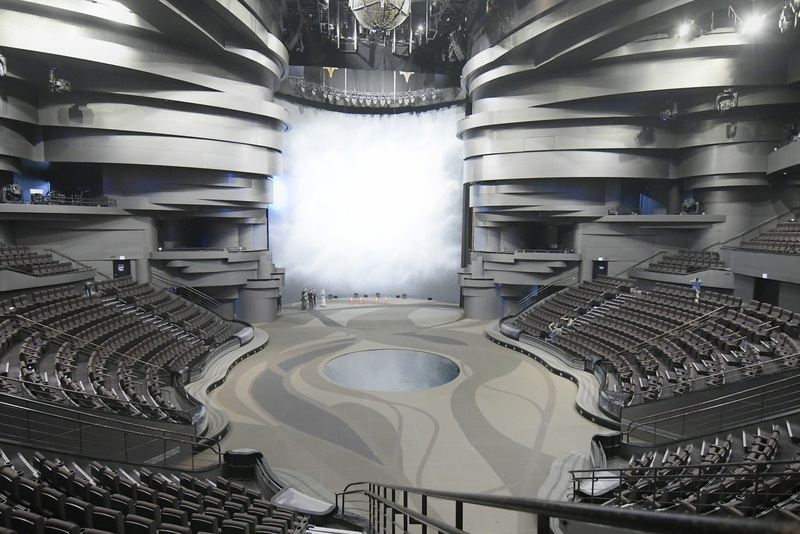 Clay Paky A.leda B-EYE’s are also at home in La Perle. “The B-EYEs work well in a small space and particularly well for atmospherics, with the use of a little smoke. It’s a wash fixture but also has a sharp focus so it’s quite a spectacular fixture,” he continued. Enrico chosen another Italian manufacturers for the cyclorama fixtures, Studio Due’s City Color, selected simply due to the product’s incredible reputation. Theatrical fixtures came in the form of the industry standard ETC Source Fours, and the pool was lit too, using IP68-rated Anolis LED lights. Controlling the intelligent lighting is yet another industry standard, an MA Lighting grandMA. “For this kind of level of project you need a high-end, rider friendly product and it can handle four DMX universes,” Enrico said. Completely integrating the lighting with the video is probably the biggest problem to overcome – there is always conflict between the two – but having a control platform such as the grandMA equipped Enrico with the best tools to overcome that challenge. Aside from the mind-blowing water effects, the audience is also taken in by the breath-taking 3D projection mapping. 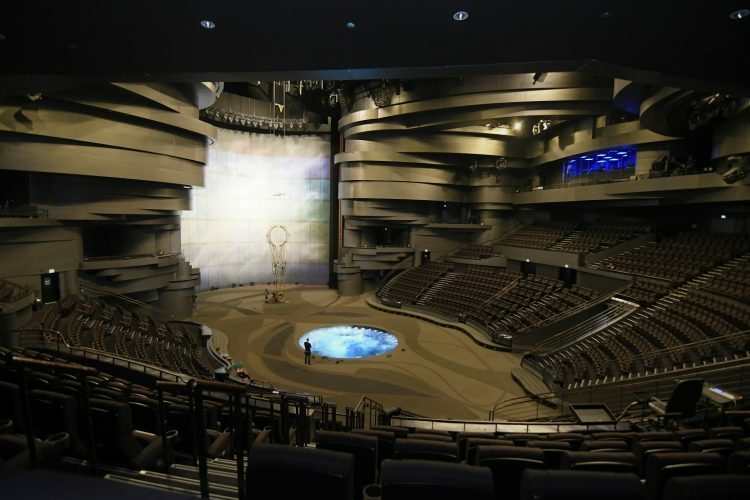 The projection screens stretch across the walls, the seats, the floors and even the building’s dome. 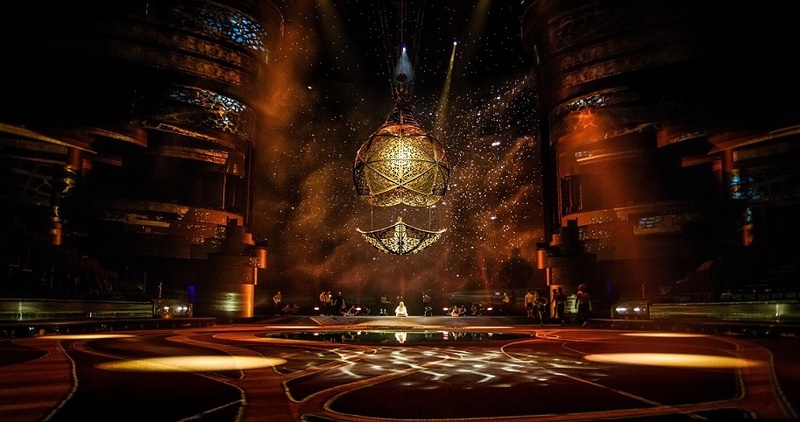 Using 20 Barco projectors and content design and creation by Montreal-based VYV, La Perle’s is home to a fully immersive visual setup. Though it may seem difficult to fathom, given the landscape of the entertainment market in the Middle East, Franco Dragone and his team are only just entering the region. But what a way to make their mark, with a one-of-a-kind theatre built in the heart of Al Habtoor City – a multi-use development incorporating three five-star hotels alongside three luxurious residential towers. 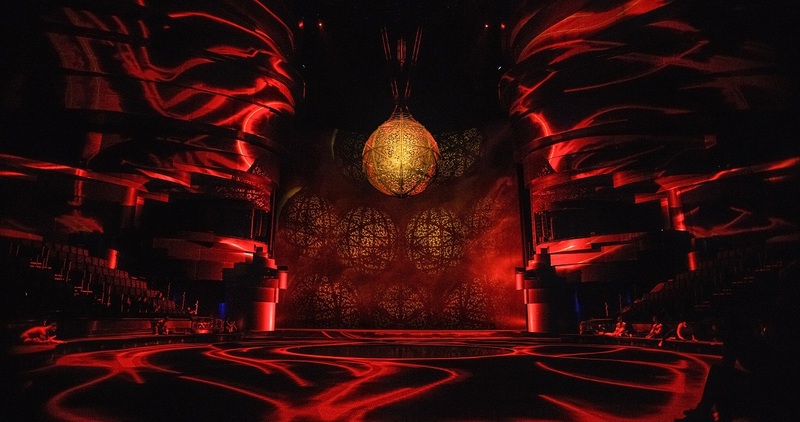 La Perle is the region’s first resident show and is billed to be an unprecedented immersive production that will mark an iconic milestone for live entertainment in Dubai and the UAE as a whole. The show is a partnership between Franco Dragone and Khalaf Ahmad Al Habtoor alongwith his son, Mohammed Khalaf Al Habtoor – the duo behind the Al Habtoor City development. The idea was born after Mohammed’s trip to see Le Rêve in Las Vegas many years ago. They broke ground for La Perle in 2013. We would like to thank and quote Rachael Rogerson-Thorley for her article about La Perle in the 2017 September/October issue. The way it described and summarized the technical elements of La Perle was a tribute to the technical team’s hard work. So we allowed ourselves to use extracts from her article.